006 And A Bit - Includes Free Daisy Spy Kit! Daisy is back and this time she's not just Daisy, she's 006 and a Bit, spy extraordinaire. With her black felt-tip moustache, dark glasses, secret spy gadgets and special spy code, she's poised and ready for action. There's just one problem, nobody can understand a word she's saying! Mrs Pike the neighbour, Tiptoes the cat and even Gabby, Daisy's best friend, are all baffled by her spy language. 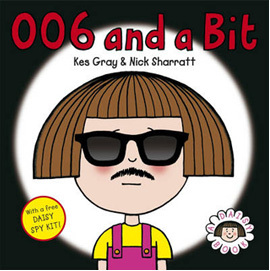 Poor 006 and a Bit is about to abandon her mission when a mysterious stranger with a blue moustache and purple beard deep pokes his head around the door . . .